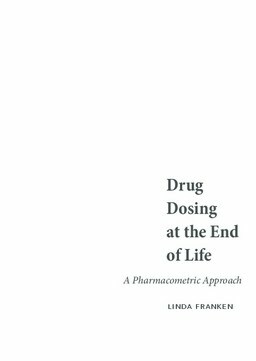 Drug dosing at the end of life is currently predominantly done according to the clinical response. This however takes time which is unwanted in the case of palliative care because of the limited life expectancy. As the palliative population is very heterogeneous in terms of co-morbidities and disease state, we performed several studies to see if we could identify patient or disease characteristics to use in an individualized dosing regimen for morphine, midazolam and haloperidol. We found that renal function, life expectancy and albumin levels were related to changes in the pharmacokinetics of morphine and midazolam. We also found that patient on haloperidol would probably need a higher midazolam dose to achieve adequate sedation. And furthermore we found that there are also drug-drug interactions that could be relative in the palliative phase. All in all the research presented in this thesis is a first step to more individualized dosing at the end of life.